Downtown plays an important role in a larger effort to enhance cycling culture in the City of Dayton, selected as a Bicycle-Friendly Community by the League of American Bicyclists. 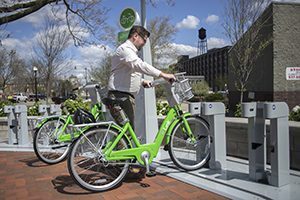 In 2015, Dayton joined the collection of more than 30 cities across the U.S. with bike share transportation systems. Link, Dayton’s bike share program, features 27 stations throughout Greater Downtown Dayton with a total of more than 200 bikes. Customers – who range from one-day users to annual subscribers – unlock the bikes and may ride to any other station or back to their original location at the end of their trip. For pricing, station maps, and other info on Link – Dayton Bike Share, visit linkdayton.org. In addition to bike parking offered at RiverScape Metropark during many downtown events, you’ll find permanent bike racks throughout downtown for daily use, including nearly 100 recently installed blue bike racks. Several downtown streets are now equipped with bike lanes or “sharrows,” designed to encourage motorists to share the road with cyclists, promote bicycle commuting and make downtown more bike-friendly. See a map of bike lanes. The RiverScape MetroPark Bike Hub features secure bike lockers, showers and restrooms, and is situated at the center of a 70-mile regional bikeway system. Bike Hub membership is designed for commuters, but such public amenities as bike parking and rentals, coin-op lockers, and restrooms are available for recreational cyclists. For membership information, call (937) 275-7275. RiverScape’s rental concession is open Saturdays and Sundays from Memorial Day weekend through Labor Day weekend. A variety of bicycles are available, as well as a host of child attachments. For more info, call (937) 278-2607 or visit the RiverScape Rentals webpage. 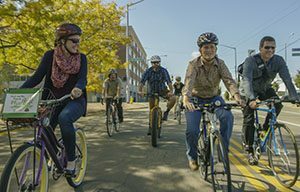 Dayton’s bike-friendly streets connect to the nation’s largest network of paved, off-street bike trails. The Great Miami River Recreation Trail is a continuous 63-mile riverfront trail that travels through charming and historic communities. The trails in Dayton link downtown to neighborhoods on both sides of the river via the Stewart Street and Helena Street bridges, as well as to natural areas and area attractions. The Great Miami River, Mad River, Wolf Creek, and Stillwater River trails converge downtown, providing excellent, safe access to downtown Dayton. Learn more at www.miamivalleytrails.org.